The never-repeating digits of `\pi` can be approximated by 22/7 = 3.142857 to within 0.04%. These pages artistically and mathematically explore rational approximations to `\pi`. This 22/7 ratio is celebrated each year on July 22nd. If you like hand waving or back-of-envelope mathematics, this day is for you: `\pi` approximation day! Want more math + art? Discover the Accidental Similarity Number. Find humor in my poster of the first 2,000 4s of `\pi`. There are two kinds of `\pi` Approximation Day posters. The first uses the Archimedean spiral for its design, which I've used before for other numerical art. 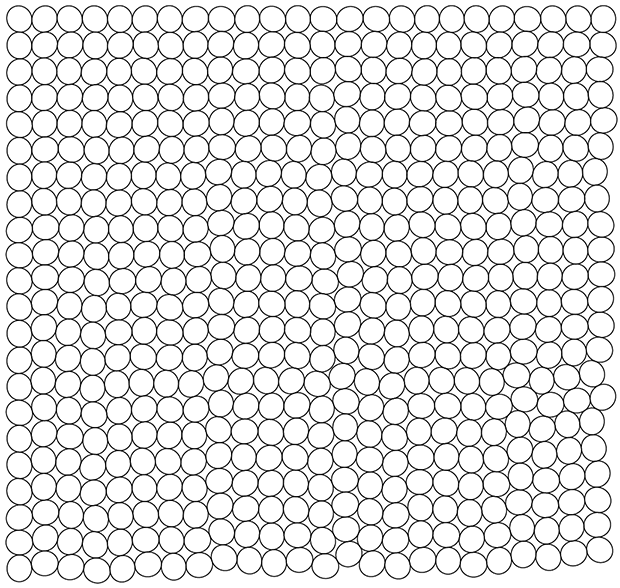 The second packs warped circles, whose ratio of circumference to average diameter is `22/7` into what I call `\pi`-approximate circular packing. where now `C` is the circumference of some shape other than a circle. What could this shape be? If we set `r=1` and solve it turns out that only a very minor deformation is required and `\delta = 0.0008`. You can verify this at Wolfram Alpha. I wanted to make some art based on the shape of the this ellipse, but a deformation of 0.08% is not perceptible. So I came up with a slightly different approach to how I define the original circumference-to-diameter ratio. You can verify this at Wolfram Alpha. This is a more useable approach since an 8% warping of a circle can be easily perceived. ▲ The ratio of the circumference of a circle, `C(r)`, to its dimameter, `2r`, is `\pi`. If we warp the circle by 8%, the corresponding ratio, if we use twice the average radius as the diameter, is 22/7. This deformation can be easily identified. Below is matrix of perfect circles along side the 8% deformed circles. 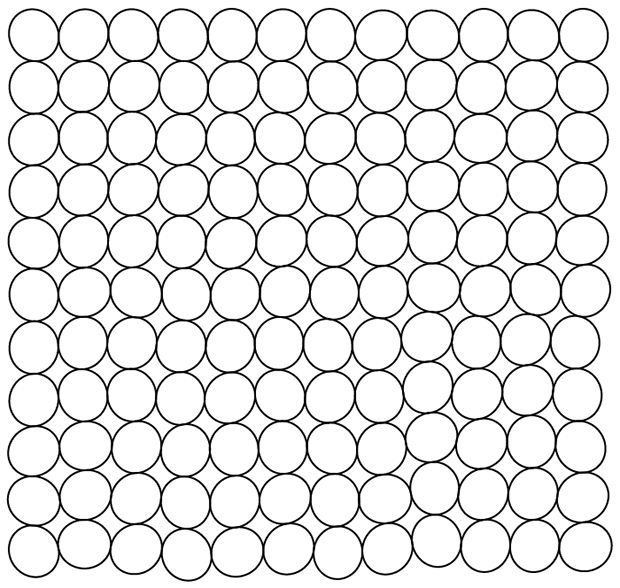 ▲ A matrix of perfect circles and ones which have been stretched by 8% along one axis and then randomly rotated. The deformed circles embody the `\pi` approximation of 22/7. The art posters are based on a packing of these deformed circles. ▲ Even more warped circles, packed. By superimposing perfect circles on the warped circles, fun patterns appear. ▲ Superposition of perfect and warped circles, packed. If you pack perfect circles perfectly, the area occupied by the circles is `\pi/4 = 78.5%`. 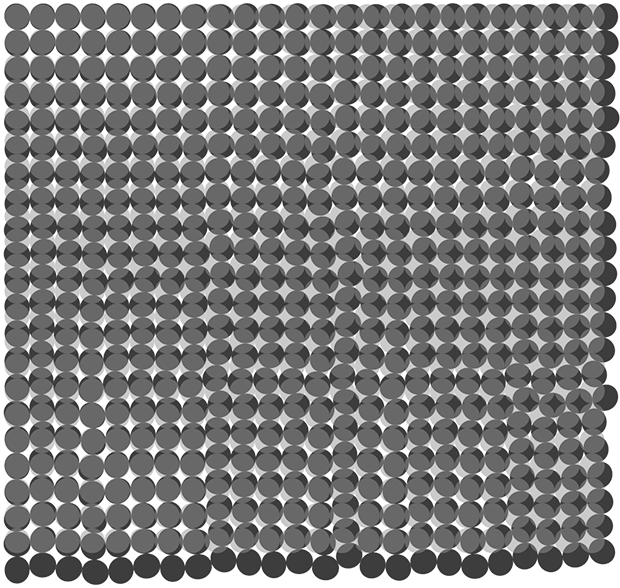 What is the area occupied by perfect packing of warped and randomly rotated (like in the posters) circles? To motivate choice of colors, I chose images with a 1970's feel. ▲ Images used for color schemes. The colors of each image were grouped into clusters—8 for the first two images and 6 for the third—to obtain proportions of representative colors. Using my color summarizer, I analyzed each image for its representative colors. Using these colors and their proportions, I colored the perfect and warped circles. ▲ Packed warped circles colored in proportion to color schemes derived from the images above. For each poster of these color schemes, two poster versions are available. In one, the perfect cirlces are shown with warped circles as a clip mask. In the other, warped circles are shown, clipped by perfect circles.